Info Christopher was born in Britain in 1947. He was educated at Marlborough College, University of St Andrews and Inns of Courtlaw School. He and his wife, Christine, have two children: Antonia and Philip. He was called to the Bar in 1972. Christopher was elected to Wandsworth Council in 1974 and was Leader of the Council from 1979 until 1983. Christopher has served as a member of the Inner London Education Authority, a member of the Association of Metropolitan Authorities, and a member of the London Boroughs Association. 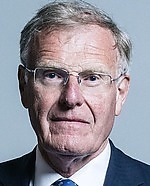 Christopher was Member of Parliament for Southampton Itchen from 1983-92 during which time he was Minister of State at the Treasury (1985-86); Parliamentary Private Secretary to Peter Brooke MP (1986); Parliamentary Under-Secretary of State at the Department of Transport (1986-90); Minister for Roads and Traffic (1990-92). He has previously been a consultant for Ernst and Young and a member of the DTI Deregulation Task Force on Transport and Communications. He was a member of the Health and Safety Commission 1993-97 and of the Local Government Commission for England since 1994. He was elected Member of Parliament for Christchurch in May 1997. He was appointed Frontbench Spokesman for Environment, Transport and the Regions and Vice-Chairman of the Party with responsibility for Local Government. In June 1998, he was appointed Opposition Frontbench Spokesman for Social Security. In September 2001, he was appointed as an Opposition Frontbench Spokesman for the Treasury. In June 2002, he was appointed as Shadow Minister of State for Transport. In November 2003, he became Shadow Minister for Environment & Transport.